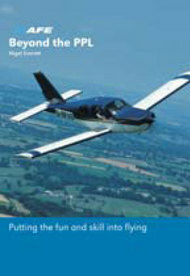 At last there is a book for every pilot who has obtained their Private Pilot’s Licence and then thought “What now?” Beyond the PPL is filled with practical advice and constructive suggestions for enjoyable, safe flying. It describes in detail many of the challenges awaiting a new pilot such as radio navigation, farm strips, dealing with ATC etc. It also deals honestly with the many pleasures and pitfalls of flying for fun including aircraft ownership, groups, aircraft hire and sharing flights with other pilots. A must for every qualified or prospective pilot, this book will become the standard guide to life and flight after flying school.